The small Mr Heater or Buddy Heater units are approved for indoor usage, so you don’t risk of CO poisoning yourself. $79 at Lowe’s. Not very powerful of course but they turn on and off easily, are lightweight, you can put them safely close to where you work, and if you refill the small bottles from a big propane bottle, as I do, then they also don’t cost much at all to run. Or you could get an adaptor hose and run them off a big bottle for days on end. Other than the smell(and all Salamander types don't stink), a Salamander is perfect for your application, especially if you get one that is 160,000 BTU's or up. Walk out, plug it in, hit the ignition and within 10 min the place is going to be warm......no waiting around. I burn wood and waste oil in my shop(30x36 uninsulated Quonset hut). If I want to work in there I have to build a fire and wait almost 2 hrs for it to get comfortable. A Salamander can do the same thing in a half an hour or less. Like you, I don;t want to heat it all the time, just when I am in there tinkering. For me the issue with that unit is just the floor space it would take up. 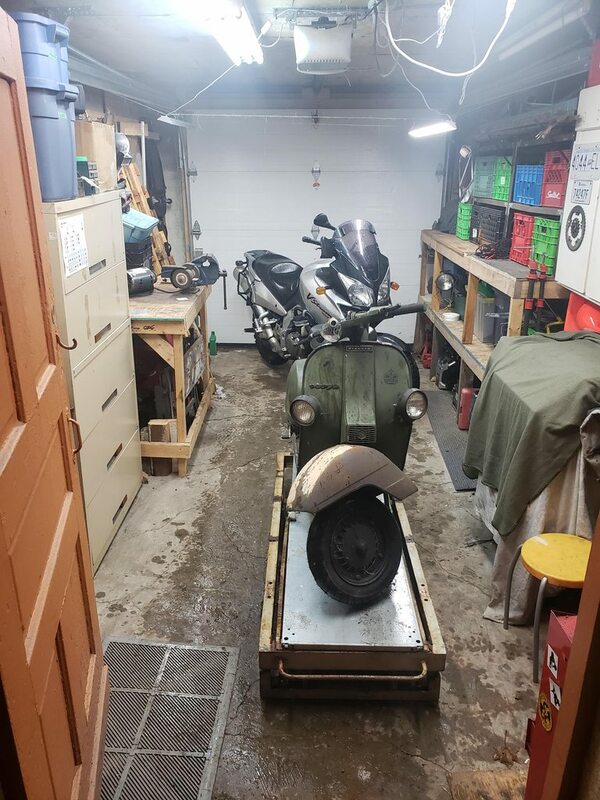 For reference, this is a picture of my tiny garage. Have you tried heating yourself? I bought an infra red radiant heater at Costco that has come in very handy. Just aim it at where you are working and you are warm quite quickly even though the space is cold. It is very good for painting things in a cold room, which I did recently. Room at 48f, item I aimed it at was at 115f. Just be careful to not get too close to it. The problem this winter isn't me being cold, it's that the entire floor is a sheet of ice from the water leaking in under the garage door due to the snow bank in the alley and at least 8" of ice build up the entire length of the alley. I can't see any way around it for this winter since when the alley melts, the water has nowhere to go, so it builds up in front of the garage door and leaks underneath. 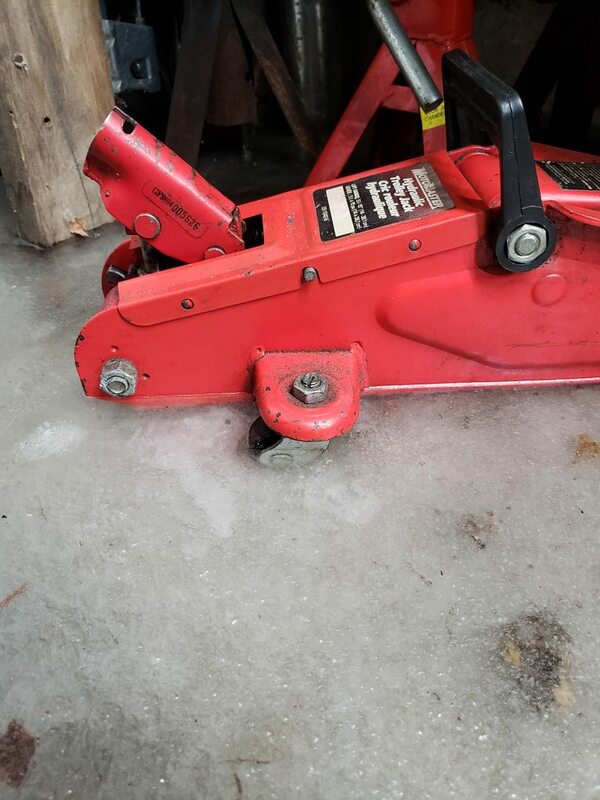 The ice is so hard and thick this year that even graters and plows can't make a dent in it. 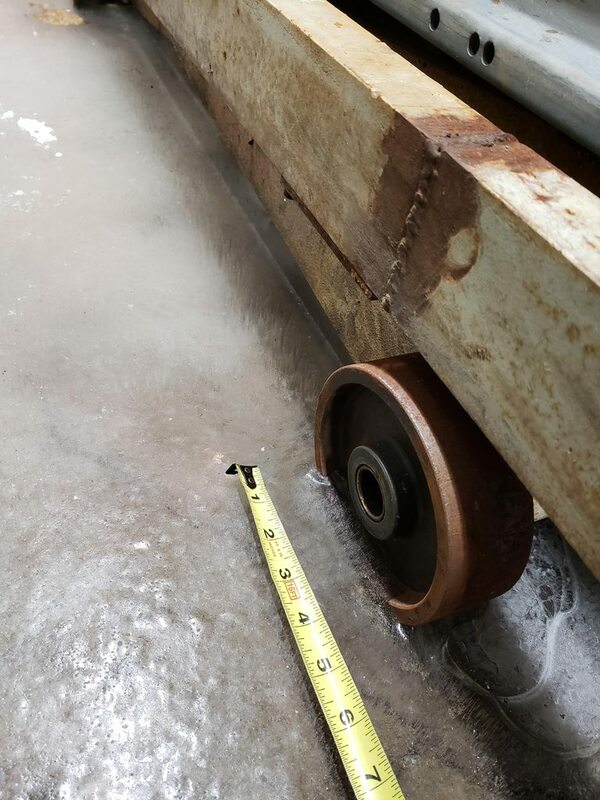 The floor drain is under the lift so the water comes in under the door and runs to the drain until it drops below freezing again and then freezes into a nice smooth skating rink. This summer I will put in a drain across the inside of the door so the water goes straight to the drain instead of running along the floor to the drain. Install Oxford heat grips and aftermarket wind hand protection. 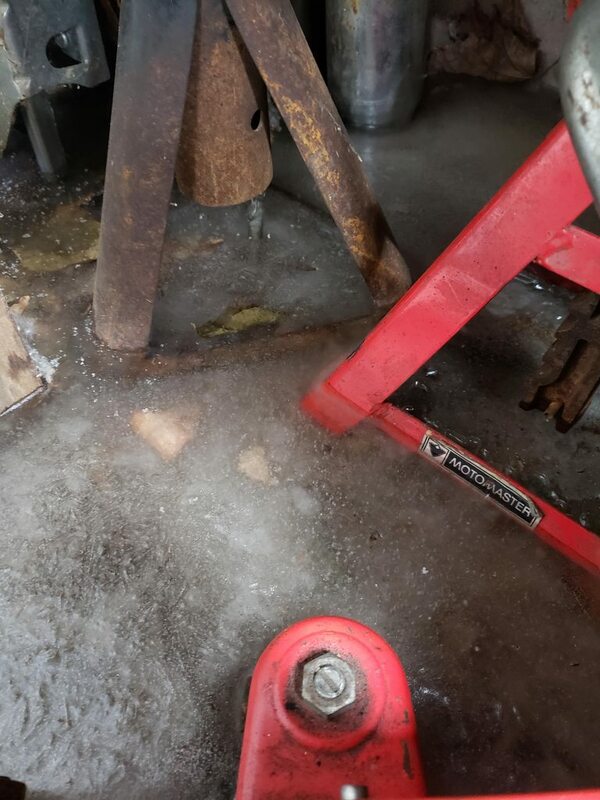 Over the past few weeks, I did several maintenance tasks recommended at certain intervals: adjusted valves (all a bit tight, naturally), changed plugs and coolant while the bodywork was excavated off, and installed a ROX riser. Naturally, I now need longer brake lines, but it was time to change the brake fluid, anyway, and one is supposed to change brake lines every 4 years (yah, right), so ordered some HEL lines thru my local bike shop. Apparently, they are waiting on the black anodized fittings I wanted in Edmonton, so I've been waiting almost 4 weeks for the last pieces before I put the bike back together and get it off the lift. Then on to the next bike......sprockets and chain on the '73 Trophy Trail. I love them. I have had a bunch over the years, and a couple Lambrettas too. That particular one I've owned for 20 years now. They are fun to change around because they are so cheap to work on, and I can rebuild the motor from being on the bike to back on the road in under 4 hours. Last edited by vanislejay; 03-11-2019 at 10:23 AM.